Thanksgiving always gives me that comfy, warm glow, ooey-gooey feeling of spending time with loved ones and gorging myself on stuffing and pie and egg nog. OK so I'll come out of the closet. I absolutely LOVE Thanksgiving! No, I'm not one of those "people from another planet" types who act like we have a perfect family and nothing crazy happens on Thanksgiving. The truth is, many cringe at the thought of being forced to spend the day cooped up with extended dysfunctional family. So don't take me for the super sappy, plastic smile type. I'm not. And I have some pretty crazy family too. And there are fights. And we all get on each others nerves. But there is love behind it all too! So I choose to embrace the holiday! The good and the bad! I pledge to don an awful housewifey apron and cook and entire Thanksgiving dinner all with a smile on my face (and a glass of merlot in my hand!). 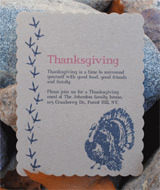 And I will create cute Thanksgiving invitations to hand out to our family and friends who will join us on the day! So I invite you to follow in my steps! I created two printable Thanksgiving invitation postcard templates to use to create cute and easy homemade invites. 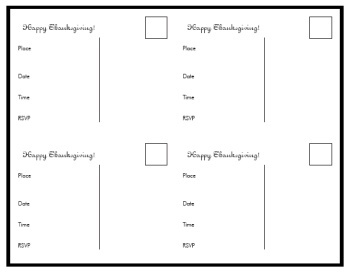 Print Your Own Thanksgiving Invitation Postcards! 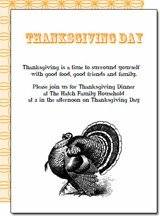 Here is the quick and easy option for creating your own Thanksgiving postcard invitations. Just print em' off from your home computer! This template is interactive! 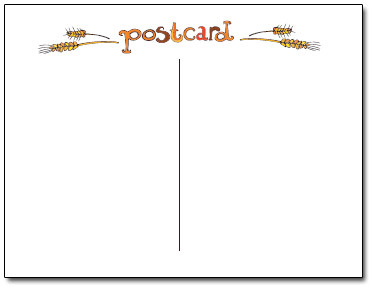 You can add your own wording to the postcard side of the template. Change the wordings, fonts, font color and/or sizes. To change the fonts and whatnot simply place your cursor into the typing area and enter in the wording. Highlight the text with your cursor and press "CONTROL" + "E" at the same time to bring up a text typing tool palette. Use the palette to change the fonts, font sizes, or even change the font color. Print the postcards onto some heavy white cardstock. The file is to make a two sided postcard so print onto both sides of course. cut the paper into quarters and viola! 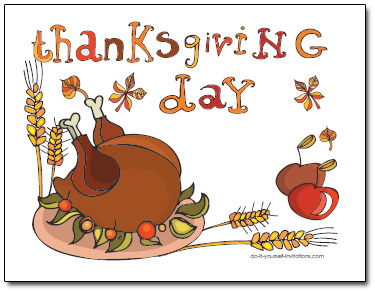 To download and print the Thanksgiving Postcard Invitations template for $1.00 click here. You will need Adobe Reader (the latest version is recommended) installed on your computer in order to open and read this file. You can get Adobe Reader here. (a new window will open so you can download without leaving this page).